An undertaking without parallel or precedent, this monumental two-volume work encapsulates much of what is known of the history of food and nutrition throughout the span of human life on earth. It constitutes a vast and essential chapter in the history of human health and culture. Ranging from the eating habits of our prehistoric ancestors to food-related policy issues we face today, this work covers the full spectrum of foods that have been hunted, gathered, cultivated, and domesticated; their nutritional makeup and uses; and their impact on cultures and demography. It offers a geographical perspective on the history and culture of food and drink and takes up subjects from food fads, prejudices, and taboos to questions of food toxins, additives, labeling, and entitlements. It culminates in a dictionary that identifies and sketches out brief histories of plant foods mentioned in the text--over 1,000 in all--and additionally supplies thousands of common names and synonyms for those foods. The essays in this volume are the work of 220 experts in fifteen countries, in fields from agronomy to zoology. Every chapter is accompanied by bibliographical references. The volumes are organized in the following sections: 1. A determination of what our Paleolithic ancestors ate during their stay on the planet (over 99 percent of the time humankind has lived on earth). 6 chapters 2. An extensive treatment of the domestication and development of each of humankind's staple foods. 60 chapters 3. The history of our dietary liquids from beer through soft drinks to water. 13 chapters 4. Studies on the discovery of vitamins, minerals, proteins, fats, and the essential fatty acids along with a look at what they do for us. 37 chapters 5. A history of food and drink for all of the countries in the world. 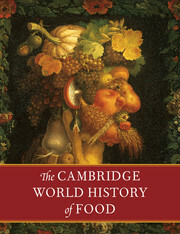 In addition there is a chapter on culinary history. 23 chapters 6. Historical issues involving human health, such as nutrition and mortality decline, height and nutrition, infection and nutrition. 18 chapters 7. Contemporary food-related policy issues are treated in this penultimate section of the work. Examples include chapters on food labeling, food biotechnology and the RDAs. 13 chapters 8. The last section of the work is a food-plant dictionary with over 1,000 entries that emphasize history and usage. The dictionary also includes over 4,000 synonyms for the names of plant food. Here readers well-informed about potatoes or asparagus can learn about lesser-known or strictly regional foods such as ackee or zamia and--among the thousands of synonyms provided--can discover that an aubergine is an eggplant, that "swedes" are rutabagas, and that "bulgar" comes from bulghur, which means "bruised grain." Part I. Determining What Our Ancestors Ate; Part II. Staple Foods; Part III. Dietary Liquids; Part IV. The Nutrients - Deficiencies and Surfeits; Part V. Food and drink around the world; Part VI. History, Nutrition, and Health; Part VII. Contemporary Food-Related Policy Issues; Part VIII. A Dictionary of the World's Plant Foods. "Simply the most comprehensive reference on food ever published."